Is it time to think about outsourcing? If you’ve been dancing with the idea, then here’s some tips on successful outsourcing. Outsourcing can be difficult to navigate, and I have had my fair share of outsourcing gone wrong, but I can also say that it’s been my own mis-communication, assumptions or not giving clear feedback that has been the cause. I totally understand that you might be hesitant. There’s the budget to consider, and you might even be feeling like you’re in a mess and not comfortable sharing your mess with someone else – especially when you’re paying for it! 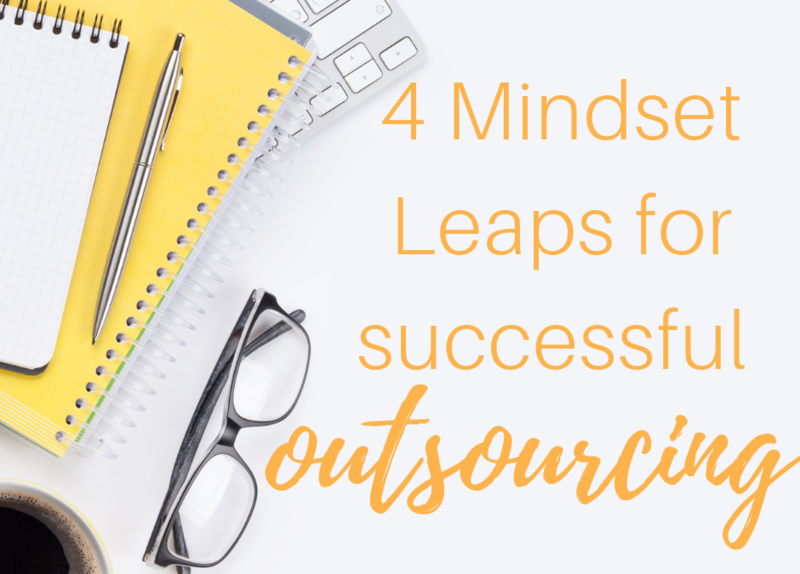 Here are 4 mindset leaps to help with successful outsourcing strategies. I’ve talked earlier about why you should hire a VA, but I also think there is a bridge to cross into successful outsourcing that’s all about mindset. Spend your time doing the tasks that grow your business, and only you can do. You can start small and outsourcing the admin/ operational elements that aren’t reliant on you. Perfectionism will only lead to a bottleneck in your business of you doing everything. Unfortunately not great for growth. Let go to grow!